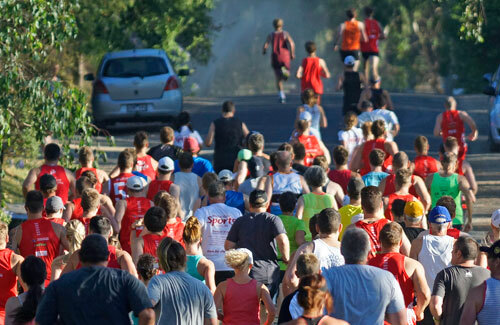 Congratulations to over 500 participants who completed their chosen distance for Run Warrandyte in 2015. It was a great turnout on the back of wild and windy night in Warrandyte! There was a wide variety of ages across all the event distances with the 12k run kicking things off at 8am, closely followed by each of the other event distances. Tomato Timing were on hand once again to provide electronic timing for everyone as they headed off to tackle the course and the hill on Pound Rd! And apart from a brief shower the weather remained pretty clear (and cool) for the 2015 event. Thank you to everyone who participated either as a runner/walker or as a supporter. It was a great local event. We also wish to acknowledge Auman’s orchard for supplying our fruit at the finish line, Beasley’s Nursery and Tea Rooms for the plants in the clubrooms and Warrandyte Chemart for the Jellybeans to give us all that extra needed boost of energy! A huge thank you goes out to our sponsors – some of whom have been with us since the beginning. Your ongoing support of this event and the local sporting clubs has enabled us to provide this event again in 2015. Our sponsors are all listed on the website, so please show your support. Thank you to our wonderful volunteers who were on hand to provide support and direction throughout the morning. Your assistance is vital to the success of this event and we couldn’t have done it without you. Thank you for taking time out of your Sunday morning to ensure another successful Run Warrandyte. And finally a big thank you to the local businesses who came along to showcase their work and support Run Warrandyte. Your presence provided a great atmosphere on the day, and we appreciate you putting in a few extra hours early on a Sunday morning. The same goes for the volunteers from Yarra Warra Kinder – thank you for providing some coloured hair spray and temporary tattoos for the kids! Congratulations to all who participated and we hope to see you all back again in 2016.